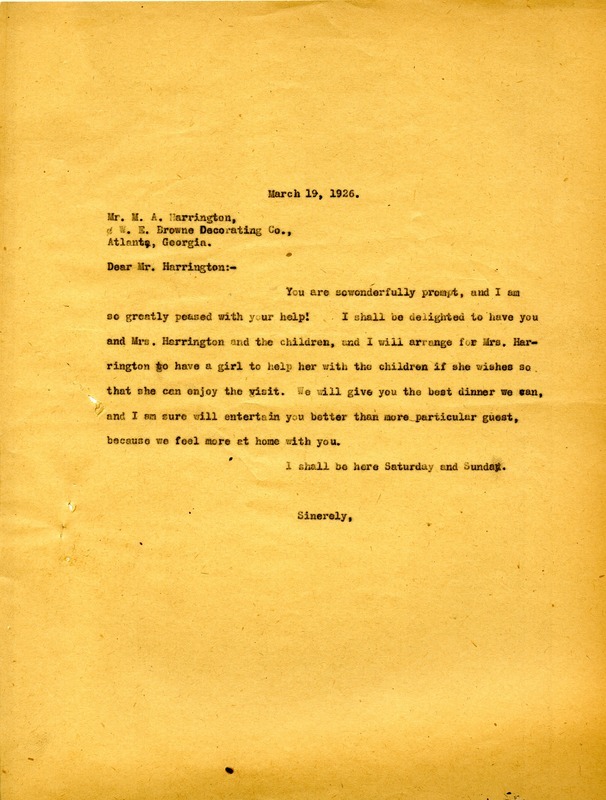 Martha Berry thanks Mr. Harrington for his prompt service and writes about arrangements for the Harrington family's upcoming visit to Berry, promising to give them "the best dinner they can" and entertain them. MB, service, visit, W. E. Crowne Decorating Co.
Martha Berry, “Letter to M. A. Harrington from Martha Berry.” Martha Berry Digital Archive. Eds. Schlitz, Stephanie A., Chelsea Risley, Alan Henderson, et al. Mount Berry: Berry College, 2011. accessed April 25, 2019, https://mbda.berry.edu/items/show/1188.